Let’s now take all the margin jargon you’ve learned from the previous lessons and apply them by looking at trading scenarios with different Margin Call and Stop Out Levels. Different retail forex brokers and CFD providers have different margin call policies. Some only operate only with Margin Calls, while others define separate Margin Call and Stop Out Levels. In this lesson, we will go through a real-life trading scenario where you are using a broker that only operates with a Margin Call. The broker defines its Margin Call Level at 100% and has no separate Stop Out Level. What happens to your margin account when you’re in a trade that goes terribly wrong? Let’s say you have an account balance of $1,000. You want to go long EUR/USD at 1.15000 and want to open a 1 mini lot (10,000 units) position. The Margin Requirement is 2%. How much margin (Required Margin) will you need to open the position? Since EUR is the base currency. this mini lot is 10,000 euros, which means the position’s Notional Value is €10,000. 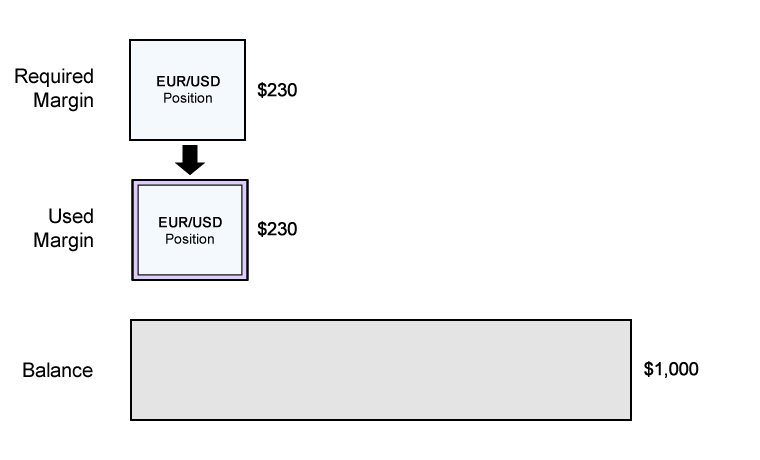 Since our trading account is denominated in USD, we need to convert the value of the EUR to USD to determine the Notional Value of the trade. The Notional Value is $11,500. 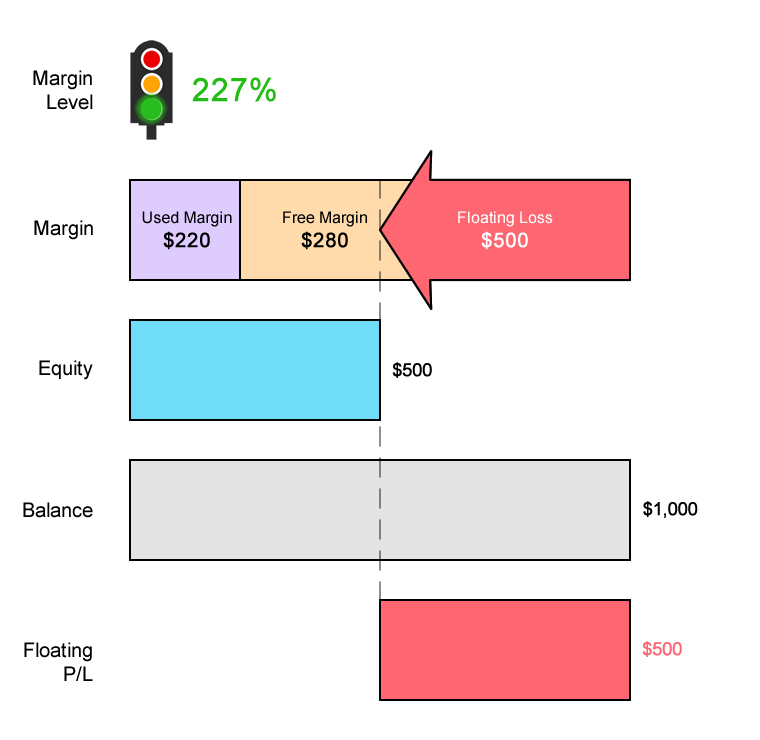 Assuming your trading account is denominated in USD, since the Margin Requirement is 2%, the Required Margin will be $230. Aside from the trade we just entered, there aren’t any other trades open. 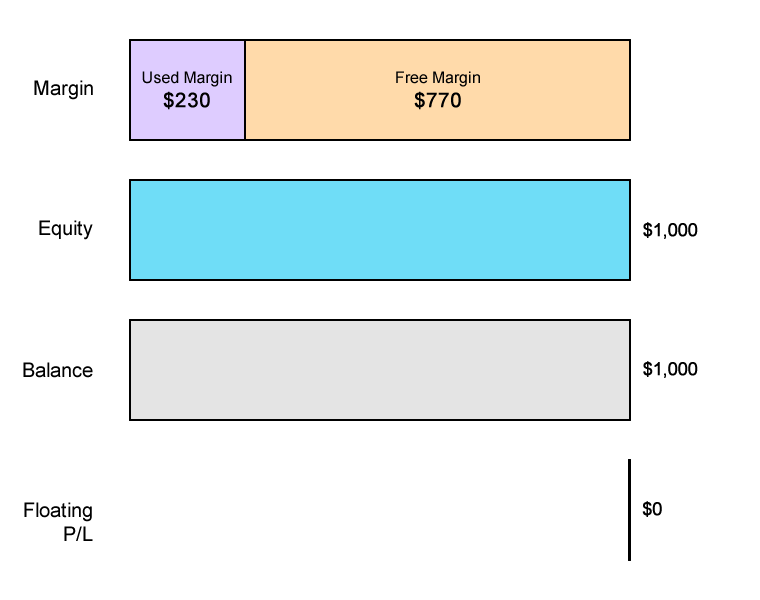 Since we just have a SINGLE position open, the Used Margin will be the same as Required Margin. Let’s assume that the price has moved slightly in your favor and your position is now trading at breakeven. This means that your Floating P/L is $0. The Equity in your account is now $1,000. The Free Margin is $770. The Margin Level is 435%. There are reports of a zombie outbreak in Paris. EUR/USD falls 500 pips and is now trading at 1.10000. Let’s see how your account is affected. You’ll notice that the Used Margin has changed. Because the exchange rate has changed, the Notional Value of the position has changed. This requires recalculating the Required Margin. Whenever there’s a change in the price for EUR/USD, the Required Margin changes. With EUR/USD now trading at 1.1000 (instead of 1.15000), let’s see how much Required Margin is needed to keep the position open. The Notional Value is $11,000. Previously, the Notional Value was $11,500. Since EUR/USD has fallen, this means that EUR has weakened. And since your account is denominated in USD, this causes the position’s Notional Value to decrease. Notice that because the Notional Value has decreased, so has the Required Margin. Since the Margin Requirement is 2%, the Required Margin will be $220. Previously, the Required Margin was $230 (when EUR/USD was trading at 1.15000). 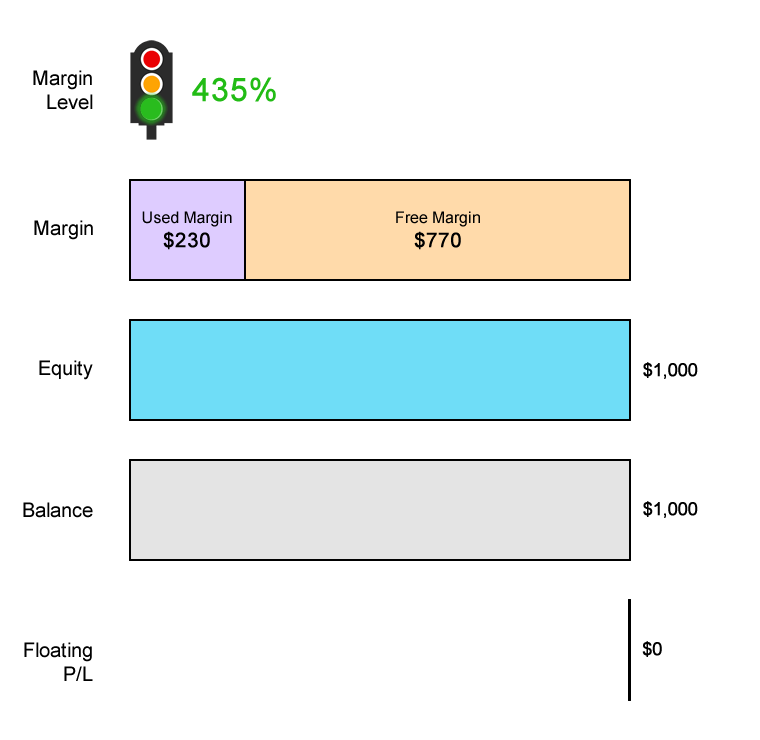 The Used Margin is updated to reflect changes in Required Margin for every position open. 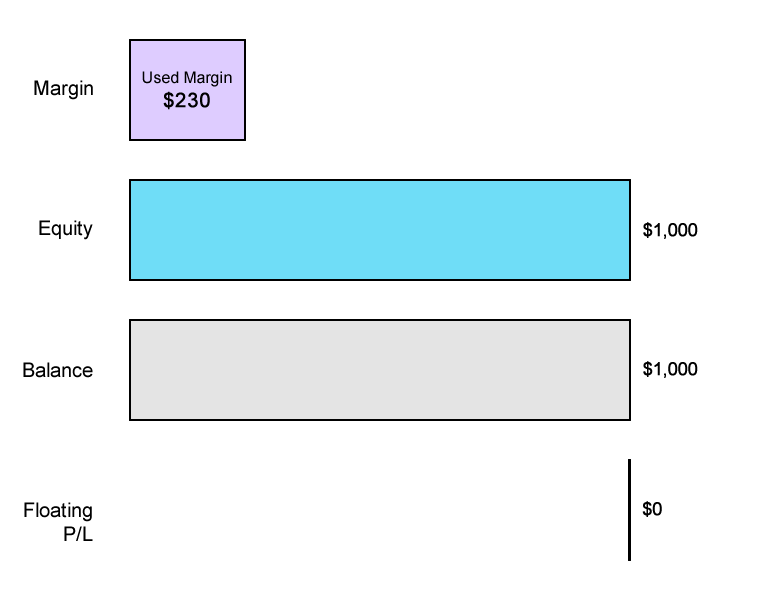 In this example, since you only have one position open, the Used Margin will be equal to the new Required Margin. EUR/USD has fallen from 1.15000 to 1.10000, a difference of 500 pips. Since you’re trading 1 mini lot, a 1 pip move equals $1. This means that you have a Floating Loss of $500. Your Equity is now $500. Your Free Margin is now $280. Your Margin Level has decreased to 227%. Your Margin Level is still above 100% so all is still well. EUR/USD drops another 288 pips! EUR/USD falls another 288 pips and is now trading at 1.07120. With EUR/USD now trading at 1.07120 (instead of 1.10000), let’s see how much Required Margin is needed to keep the position open. The Notional Value is $10,712. Since the Margin Requirement is 2%, the Required Margin will be $214. Previously, the Required Margin was $220 (when EUR/USD was trading at 1.10000). EUR/USD has now fallen from 1.15000 to 1.07120, a difference of 788 pips. This means that you have a Floating Loss of $788. Your Equity is now $212. Your Free Margin is now –$2. Your Margin Level has decreased to 99%. At this point, your Margin Level is now below the Margin Call Level! Your trading platform will automatically close out your trade! Your Used Margin will be “released”. Your Floating Loss will be “realized”. Your Balance will be updated to reflect the Realized Loss. Now that your account has no open positions and is “flat”, your Free Margin, Equity, and Balance will be the same. 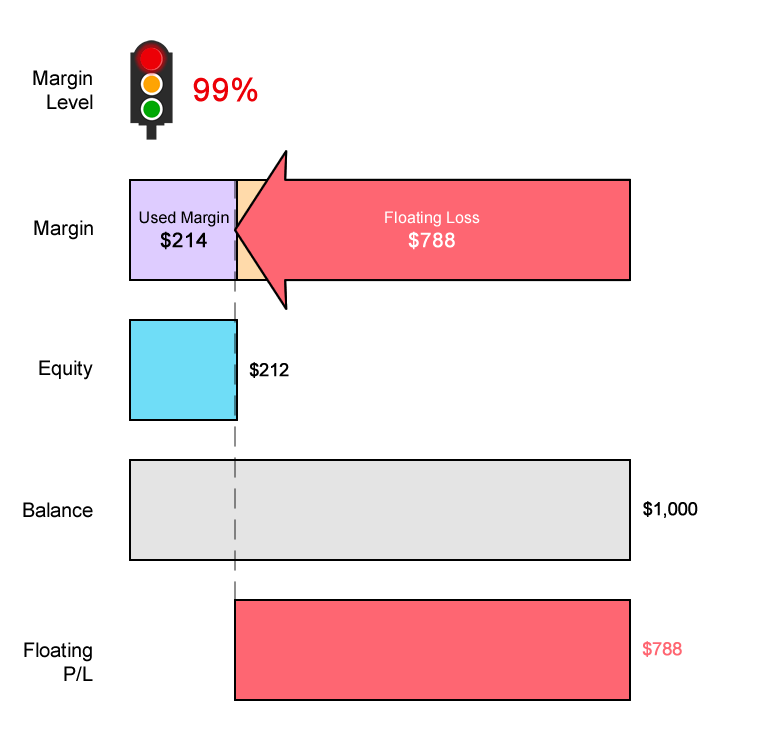 There is no Margin Level or Floating P/L because there are no open positions. Let’s see how your trading account changed from start to finish. Before the trade, you had $1,000 in cash. Now you’re left with $212! You’ve lost 79% of your capital. Some traders suffer a terrible side effect when finding out their trade has been automatically liquidated. 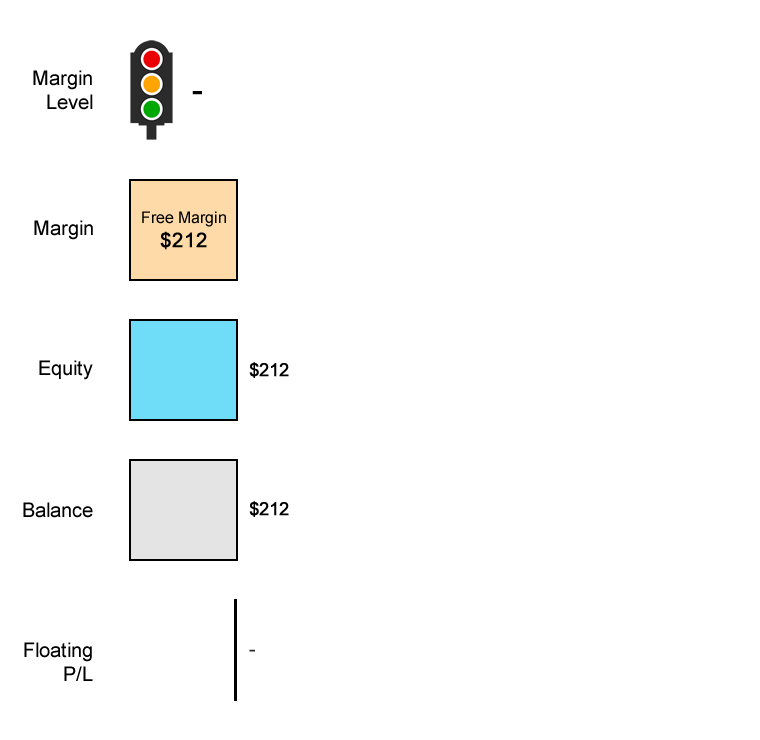 In the next lesson, we provide a different trading scenario where your broker has a separate Margin Call AND Stop Out Level. Let’s see the difference between happens there versus what happened here.